Title I and the McKinney-Vento Act allow the Nye County School District to provide enrollment assistance, school supplies and instructional support to children and unaccompanied youth residing in temporary emergency shelters, hotels, motels, parks, cars, RV parks, or living with relatives/friends due to economic hardship. Support services include meeting the physical, social, and emotional needs of students and empowering parents to support their children in this endeavor. 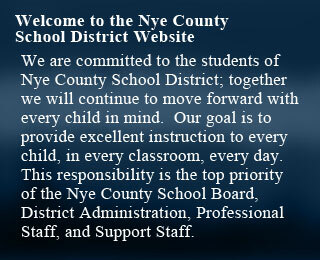 All appropriate resources from the Nye County School District are utilized to achieve this goal. How does Title I help schools comply with the McKinney-Vento Homeless Education Assistance Improvements Act of 2001? · Transportation to the "School of Origin" with NCSD school bus. · After school enrichment programs at selected school sites. · Free breakfast and lunch for students K-12. 2. Provides staff development workshops for district personnel focusing on the needs of homeless children and youth. 3. Partners with businesses, community and local schools to provide resources for the families in transition and information regarding homelessness. 4. Maintains Title I Homeless site on NCSD Web site. 5. Distributes community resource information to schools and parents. If you feel your child may qualify for this program, contact their school for more information. For information about our scholarship program go to the "Forms" section to download an application.